Brian Lyter enters his first season as President-Salvi Sports overseeing operations of all Salvi Sports franchises. He spent the 2015-2018 seasons as the RailCats General Manager. 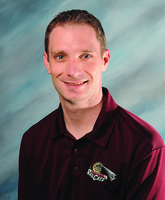 He spent the 2014 season as the RailCats Assistant General Manager and 2013 as the Director of Sales. 2019 will be Brian’s 11th season in minor league baseball. Prior to joining the RailCats Brian spent the previous four seasons with the Arkansas Travelers, the Double A Affiliate of the Los Angeles Angels of Anaheim. He started out in 2009 as a stadium operation intern and became the Director of Stadium Operations in 2010. He worked as an Account Executive and Merchandise Manager in 2011, and was the Director of Food and Beverage for the 2012 season. Brian, originally from Allegany, New York, graduated from West Virginia University with a Bachelor’s degree in Sports Management, and minors in Business Administration and History. He is an avid Buffalo Bills, West Virginia Mountaineer, and New York Yankee fan. Brian, his wife, Laura, and daughter Annalee reside in Merrillville.